The ferry service between Rothesay and Wemyss Bay is likely to be severely disrupted on Friday if industrial action by CalMac's RMT members goes ahead as planned. Ferry services to and from Bute could be disrupted at the end of next week after the RMT union announced details of industrial action in a row with CalMac and the Scottish Government. RMT members will refuse to work overtime on Wednesday, June 24 and Thursday, June 25, and crewmen have been told not to take on any duty on Friday, June 26. 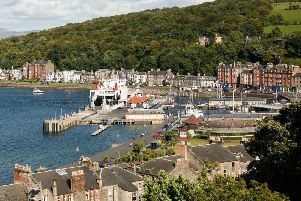 The action, should it go ahead, is likely to affect the Rothesay-Wemyss Bay ferry service - though Bute should not be completely cut off as crew on the Rhubodach-Colintraive route are not RMT members. The industrial action - dates for which were announced as this issue of The Buteman was going to press - follows a vote last week in favour of both a strike and action short of a strike. Ninety-two per cent of union members who took part in the ballot voted in favour of strike action, and 98 per cent for action short of a strike over job security, pensions and working conditions. The turnout was 60 per cent, meaning 55 per cent of those eligible to vote backed strike action and 58 per cent backed action short of a strike. RMT general secretary Mick Cash said: “RMT members on CalMac rightly feel that they are caught in the crossfire of an unnecessary and damaging tendering battle that leaves jobs, conditions and pensions hanging by a thread. That is simply intolerable. “As a result of the failure to give staff the most basic assurances, we are now using the massive mandate secured in the ballot and confirming a programme of industrial action.